The 23-story Falcon 9 rocket’s upper stage suddenly blew apart at Cape Canaveral during fueling for a preflight “static fire” test Sept. 1. The explosion occurred about eight minutes before the first stage’s nine Merlin 1D engines were supposed to ignite for a few seconds while the booster remained firmly restrained to the ground. 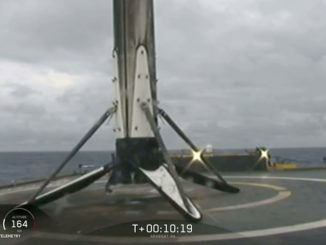 At that point in the countdown, the Falcon 9 rocket’s propellant tanks are typically not yet pressurized for ignition, based on standard practice on previous SpaceX missions. 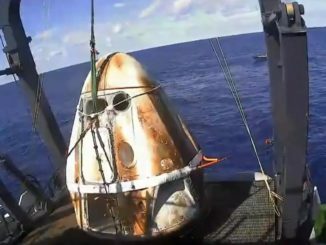 Updates released by SpaceX on Sept. 2, the day after the accident, indicated the problem first appeared near the liquid oxygen tank on the Falcon 9 rocket’s second stage. Both stages of the Falcon 9 burn the same mix of RP-1 kerosene and liquid oxygen propellants. A video of the explosion recorded a few miles away from Cape Canaveral’s Complex 40 launch pad by USLaunchReport.com showed the light from the fireball first appearing near the upper stage, just below the rocket’s nose cone, which contained the Amos 6 communications satellite owned by Israel’s Spacecom Ltd. The audio in the video is delayed due to the distance of the camera from the launch pad, which is believed to be less than 3 miles. A few seconds before the violent sound of the blast arrives at the camera, the microphone picks up a squeak sound and a quieter bang. Responding to a comment on Twitter that the audio sounded like a metal joint popping under stress — perhaps a weld failure — Musk wrote that conclusion is most likely true, but an analysis of data gathered by sensors aboard the Falcon 9 has so far revealed no such problem. 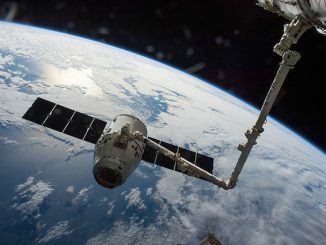 SpaceX was preparing to launch the Amos 6 satellite Sept. 3 into a “sub-GTO” transfer orbit arcing as high as 18,000 miles (29,000 kilometers), en route to a final operating station in an equatorial geostationary orbit. Musk wrote that SpaceX has received “support and advice” from NASA, the U.S. Air Force and the Federal Aviation Administration, the agency which has oversight authority for commercial space operations. SpaceX has asked that any other recordings of the explosion be emailed to report@spacex.com. The company has not released details on the damage the fireball caused at the Complex 40 launch pad, SpaceX’s primary launch facility at Cape Canaveral. Construction crews hope to complete modifications to launch pad 39A, a a former space shuttle pad a few miles north of Complex 40, by November to allow Falcon 9 and Falcon Heavy flights there. But SpaceX has not set a timetable for the Falcon 9’s return-to-flight as the company wrangles with its second rocket failure in less than 15 months. 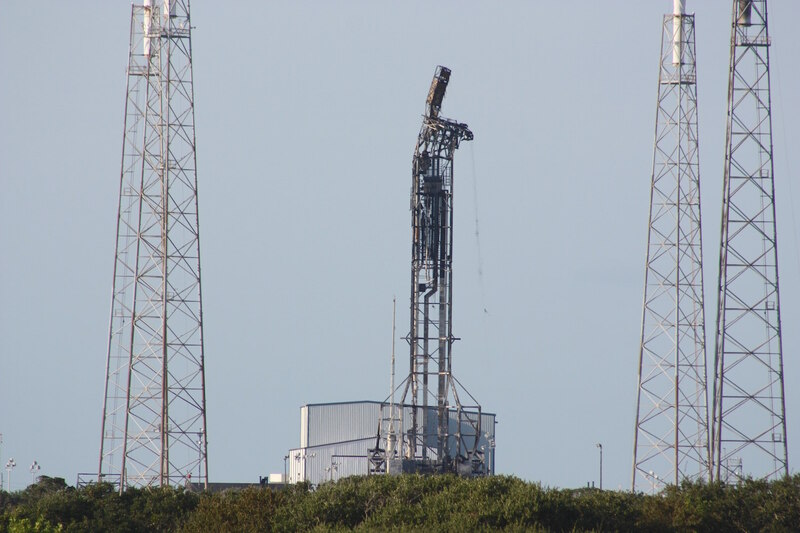 The top of the strongback structure at Complex 40, which positions the booster upright after rollout, feeds propellant into the Falcon 9 rocket and routes electrical and purge air to payloads, is badly mangled and will need repair or replacement. Clean-up activities initially required hazardous material experts because of the toxic propellants loaded aboard the Amos 6 satellite. The rocket integration hangar, located about 600 feet (200 meters) from the launch mount at Complex 40, appeared to have escaped visible damage. Soot covered one of the launch pad’s four lightning towers, and burn marks covered ground equipment near the site where the Falcon 9 stood, including a support building at the base of the pad housing avionics and other gear, and trailers containing high-pressure gas tanks. SpaceX leased Complex 40 from the U.S. Air Force in 2007 after the pad’s service to the Titan rocket program ended in 2005.